CRSSD Festival just announced the phase one lineup for its Fall 2018 event September 29-30. 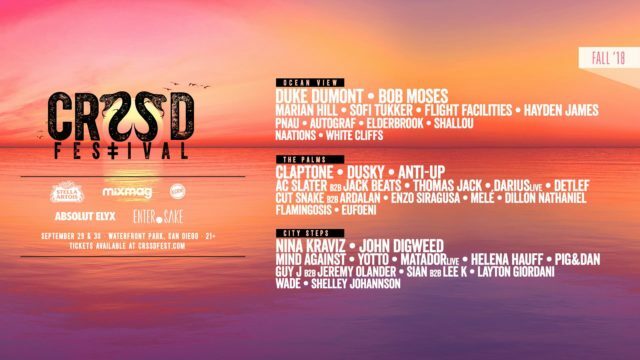 Located at the iconic Waterfront Park in Downtown San Diego, CRSSD is a biannual festival that goes down in the spring and fall offering forward thinking live and electronic music curation coupled with one of California’s most idyllic urban venues. CRSSD has built its legacy by curating the future-tastes of the evolving West Coast music scene. Now seen as a barometer for both the rising underground and explosion of live electronic, CRSSD has solidified itself as a beacon for the more mature and innovative sounds of the modern scene. The Fall 2018 lineup is one of CRSSD’s best to date. The Ocean View Live stage will feature the likes of Duke Dumont, Bob Moses, Marian Hill, Flight Facilities, Sofi Tukker, Hayden James, PNAU, Autograf, and more. All shades of house music will be on display at The Palms stage with Claptone, Dusky, Anti-Up (Chris Lake and Chris Lorenzo), AC Slater b2b Jack Beats, Will Clarke, Thomas Jack, Darius Live, Detlef plus a slew of other party-starting talents from across the 4/4 spectrum. Continuing CRSSD’s commitment to highlighting the global techno elite, fall will host heavy-hitters including Nina Kraviz, John Digweed, Mind Against, Matador, Pig&Dan, and Helena Hauff at the City Steps stage. CRSSD has established a unique vibe built around Southern California culture and dance music’s underground roots, becoming a destination for music devotees who crave the avant-garde shades of electronic music. Just minutes away from the Amtrak station, CRSSD’s grassy haven is complete with picturesque sunsets, splash friendly fountains, and three waterfront stages. CRSSD also offers craft beer, gourmet food vendors from San Diego’s best restaurants, and a full mixology program to reflect its status as a 21+ festival. I experienced my first CRSSD earlier this year at the Spring 2018 installment, and I'm looking forward to making my way back to the San Diego waterfront for my 2nd dose this fall!